An unprecedented situation is taking place in the city of Port Said – complete self-management, a rejection of everything that authority represents. It is a situation that the main actors in the Egyptian struggle at this time – the workers – are trying to reproduce in other cities too. 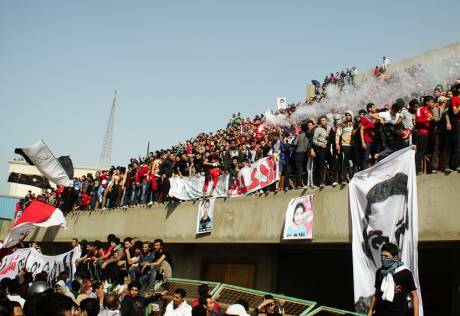 Port Said is now completely in the hands of the people. At the entrance to the city, in place of the old police roadblocks, there is a checkpoint manned by locals, mostly striking workers calling themselves the “popular police”. The same is true for the traffic – no more traffic cops but young men, students and workers who are self-managing the city’s traffic. Civil disobedience: the city is mainly characterized by its total rejection of Morsi’s government in all its forms. This translates into getting rid of the police, the rejection of work and the government education system. As far as “security” is concerned, under self-management the streets are safer than ever before. Following the street protests, the people’s anger after the 21 death sentences linked to the massacre of Port Said and the 40 victims of the clashes which followed, the police was forced last week to accept letting the people take over the city. Morsi’s government has agreed to recall the police because of the irrefutable video evidence which shows policemen shooting and killing demonstrators in cold blood, but also because it is convinced that a city could never be able to self-manage itself alone and that Port Said would sooner or later ask the government to intervene in order to quell the riots that would probably break out. Instead the reality is much different and demonstrates that a city without the “forces of law and order” is safer and more liveable. So the reality is this: powerless soldiers watching over key points such as the courthouse and the city’s extremely important port (now on strike) and the “popular police” which is looking after the city’s security. The rejection of everything that represents authority can also be seen in the refusal to pay government taxes and utility bills, and the refusal to communicate in any way with the government, be in central or local. 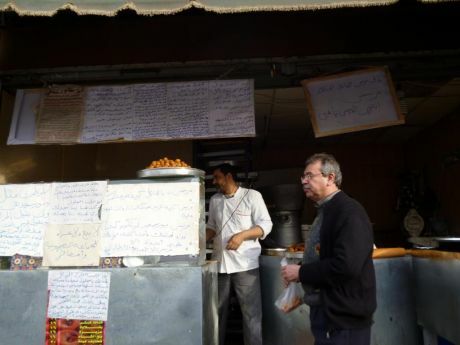 Bread is produced (in the photo below you can see a shop selling bread at low prices; the signs explain the reason for the protest); foodstuffs, hospitals and pharmacies remain open. In each factory, it is the workers who decide whether or not to continue production and the answer in general at the moment is NO. Justice first, completion of the revolution first – only then will production recommence. A situation that may seem impossible to some. On the pages of this site [ed. – infoaut.org] we have spoken before about Port Said, through different eyes. But after the death sentence against the 21 people accused regarding the massacre at the stadium, a new popular consciousness has arisen in this city, once very traditionalist in all probability. Indeed, those condemned were 21 young people, mostly students, whereas the responsibility for the slaughter lies firmly in the political arena; the sentence seems to have been more of a sop to those who sought justice than anything else. None of the accused comes from the ranks of the police or the State and its secret services. This was understood by Port Said and, as soon as the death sentences were handed down, huge protests exploded leading to the death of about 40 demonstrators, some of whom actually died during the funerals of other victims of the street clashes. This led to the beginning of the strike and the civil disobedience. Rage, initially born from a desire for justice for the death sentences and the following 40 victims but which then grew and has become political. The strong participation by the workers, the growing consciousness among the people of Port Said – these have made this protest into a struggle with precedent which is now threatening Morsi’s government. It is a struggle which could really cripple the regime if it were to spread to other cities. They no longer ask – as they did only a week ago – not to punish the citizens of Port Said for crimes committed instead by the regime. Now they ask for justice for all the victims of the Revolution, now they shout out for the regime to fall. On Monday there was a large demonstration in the streets of Port Said – the independent union of workers, students, the revolutionary movement, all came down into the streets. Many came from Cairo to bring their solidarity to the workers and the city in struggle. A huge march swept through the streets of the city, calling for a general strike throughout the country. In the meantime other Egyptian cities in recent weeks have seen large strikes – in Mahalla, Mansoura and Suez, workers in many factories folded their arms for weeks. And hundreds came onto the streets to call for a general strike throughout the country, many schools and universities announced a general strike soon. 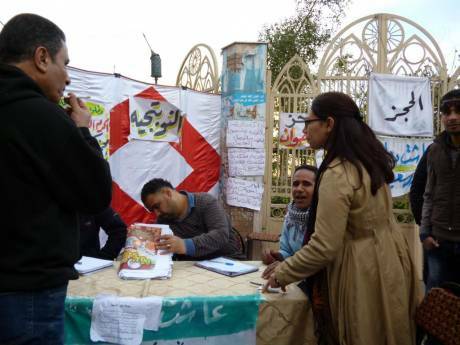 There are many workers and various social sectors who are on strike without being able – for now – to spread the strike and the struggle, as has happened in Port Said instead. We do not know for how long this experience, known as the “Egyptian Paris Commune” can last. Certainly it is difficult to carry on a struggle like this at a time when the central power can cut off water and electrical supplies and if it hasn’t done so thus far it is only because it is afraid of even greater explosions of anger. Furthermore, the continuation of the workers’ strike is closely linked to the chances of it spreading to other cities. Initially the inhabitants of Port Said had announced that they intended to continue the strike until 9 March next – the date on which the 21 death sentences will be confirmed. Now, thanks to the actions of the workers, the future is uncertain but without doubt full of potential. Translation by FdCA – International Relations Office. Posted on March 21, 2013, in North Africa and tagged Egypt, Egyptian Revolution, Worker's Movement. Bookmark the permalink. 5 Comments. This is magnificent! There must be parallels between this and workers control of Barcelona/Catalonia in the Spanish Revolution….? present. It’s great to come across a blog every once in a while that isn’t the same unwanted rehashed information.